Too much stuff to do at Saltwater? Stay another night. As long term locals, we’ve always known that Saltwater was a pretty special place worth exploring thoroughly. Spending more time down there with our new tour business gave us the opportunity to really discover its wonders. There’s the beach of course. A wild and relatively isolated surf beach of white sand that provides our local surf crowd a fairly regular pumping wave to tackle. You often see a lone beach fishermen testing his skills as well. Then there’s the southern end of the beach where you rock-hop over a few boulders before stepping onto rich red beds of ancient mudstone, dotted with small and colourful rock pools brimming with life. Keep wandering and you find a wonderful cave from which you can watch as waves crash over the outcrop and seabirds such as sooty oyster catchers try their luck in the shallows. Anyone keen for a swim can tackle the waves or wander only 500m north along the Light to Light Track. Look out for the well worn path meandering off to the right as you head north and follow your nose. You’re rewarded initially with a small land bridge across an old cave where the sea appears through a hole in the earth. A few more steps and you’ll see your destination. Just a few flat rocky sections to traverse and you’re there – what a reward! A sensational, relatively protected south facing beach where you can escape that sharp nor’easter and enjoy a swim in calmer waters. The snorkelling off the north point is excellent – as long as you have a bit of experience. These estuaries are inaccessible by foot – kayaking seems the ideal way to experience their beauty and tranquility. To top this offer, there are two estuarine creeks running west off the north and south ends of the beach. Woodburn Creek to the south is dark and tannin stained, with a great display of melaleuca (ti-tree or paperbak) growing in a waterlogged environment. Birds you may see? White-bellied Sea Eagle, Azure kingfisher, White-faced Heron and more. Saltwater Creek, meandering off from the northern end of the beach, is subject to tidal inundation fairly regularly. A lovely sandy bottomed estuary that winds its way into a beautiful landscape of ti-tree, native grasses, larger trees with overhanging branches creating archways across the creek. Paddling a kayak in these creeks takes you to a world where humans rarely venture. These places are inaccessible by foot – kayaking seems the ideal way to experience their beauty and tranquility. 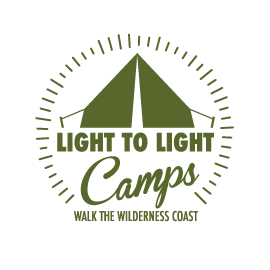 Our newest tour: Tour #5: Saltwater Sojourn allows our guests to combine the 31km Light to Light Walk with a camping experience like no other – including 2 nights at Saltwater Creek so you can experience all this amazing place has to offer. Check out the details here and give us a call (p. 0429 961 047) or email if you’d like to discuss options.